When was Greenland ice-free last? When were the Vikings around? That’s got nothing to do with art? 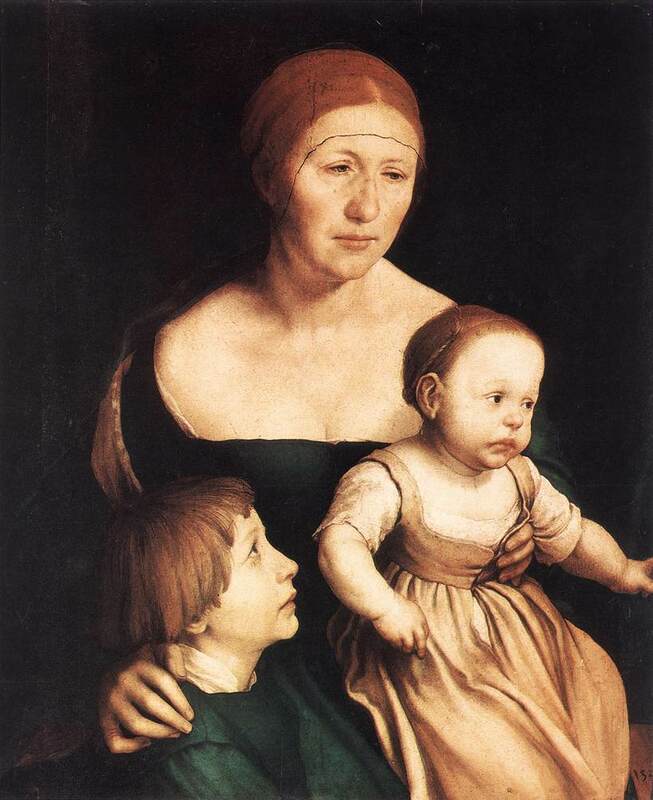 Looking at paintings from the late Middle Ages (15th century) in the past, I was always shivering and feeling sorry for the people in those pictures, especially women, because of all these open-necked dresses. Because back then it was dark and cold! Right? I was wondering whether they couldn’t afford anything warmer to wear or if it wasn’t really invented yet. Until some years ago, when I came across a text regarding the climate and weather at these times and before: Around 1000 AD, it was HOT! Very hot! Really hot summers and cold winters all over Europe. That lasted for a while! It is interesting that originally, ALL clothes were made from sheep wool! That could be a bit warm in the summer and itchy on the skin, too. Over time, linen and silk were used as well but only rich people could afford it. The majority of people continued with woollen garments. They hadn’t changed an awful lot since the Vikings. The shaved forehead of the ladies in the above paintings was a fashion thing at the time. A lot of women back then are painted like that. Not so hot in a cold winter, I say. But then again, they were usually wearing all sorts of unusual head dresses. The cone-shaped tall hats of the ladies are quite striking. Another fashion thing and I wouldn’t want it for myself. Very unpractical! They were also very expensive and thus reserved to the wealthier women. This lovely painting of a young woman above shows her standing outside looking in through the open window. Space, air and openness seem to dominate. Cosimo Tura’s picture is set outside, too, and so is the following one. These hats above remind me of the big first-school-day cones filled with sweets in some countries. They would be the other way round as in upside down so the sweets don’t drop out… I had one myself, a shiny emerald green one. Lovely! The lady’s outfit above looks a bit fresh to me but maybe it was a warm day. Whether it is inside or outside is hard to say. The black background is getting more common in the 16th and 17th century and is at its height at Rembrandt’s (1603-1669) time, making him famous. Would it reflect the bad weather resulting in darker times? More interior scenes are coming up as well. Weather-related? Darker inside than outside and also darker clothes. All that would have an effect on people’s health and moods. Look at the following pictures and make up your own minds! There is Elizabeth I. 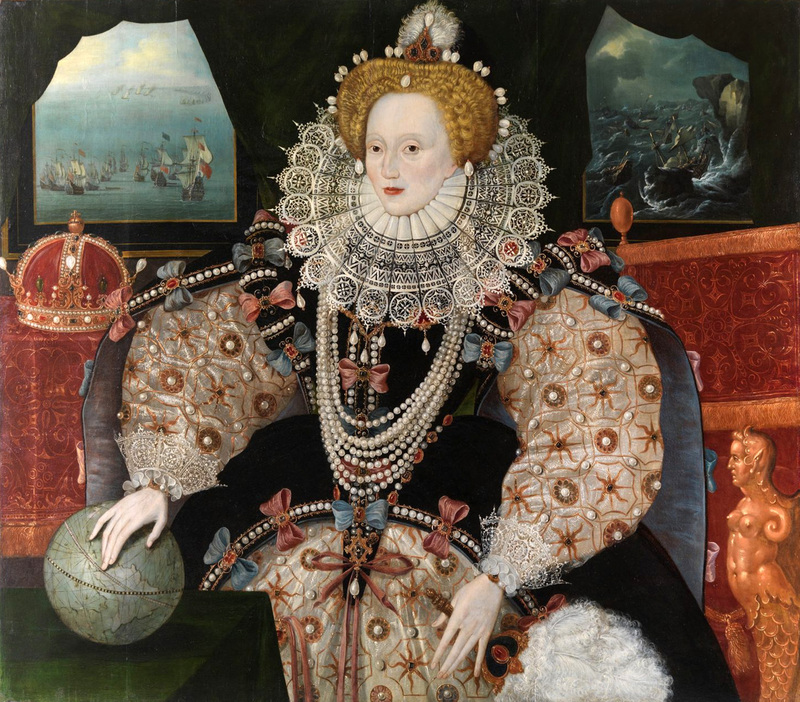 (1530-1603) of England with her long-sleeved and high-necked dresses. The weather and climate weren’t so great then. Cool summers and fairly mild winters, plenty of rain. Generally, the climate was changing quite a bit during the 14th and 15th century and with it the clothing. By the 16th century and even more the 17th century, it had cooled down sufficiently for people to be dressing visibly warmer and so they were mostly wrapped up to their chins. Elizabeth is clearly indoors, the happy man probably in the artist’s studio. Everyone warmly dressed, and that is inside the house with the windows closed. They CAN be fully opened! Nearly everybody in the room has the head covered. The school room looks rather chaotic. Again, everybody well wrapped up and plenty of heads covered, too. One biggish room for all ages and not the brightest. Clothes, weather, rooms, paintings – everything has gone darker. What do you think? Greenland was ice-free last around 1000 AD. The Vikings arrived there in 999 AD, liked it, called it the GREEN LAND and stayed. Well, at least some of them. The fact that Greenland was ice-free shows that the weather must have been considerably warmer than today all over Europe which accounts for the light, skinny dresses at least in summertime. People were not just painted like that. It was actually warm enough, if not hot, for this fashion. By the way: Plenty of beech trees around! Wrapping up is clearly a sign for a change of climate and weather which started to change for the better again during the 18th and 19th century until today. Brighter weather and moods! Brighter, more intense colours! Better health! Great!!! Artworks, especially paintings, are a great reflection of the times they are created in. If you want to know something about the past, before photography, just look at the paintings.